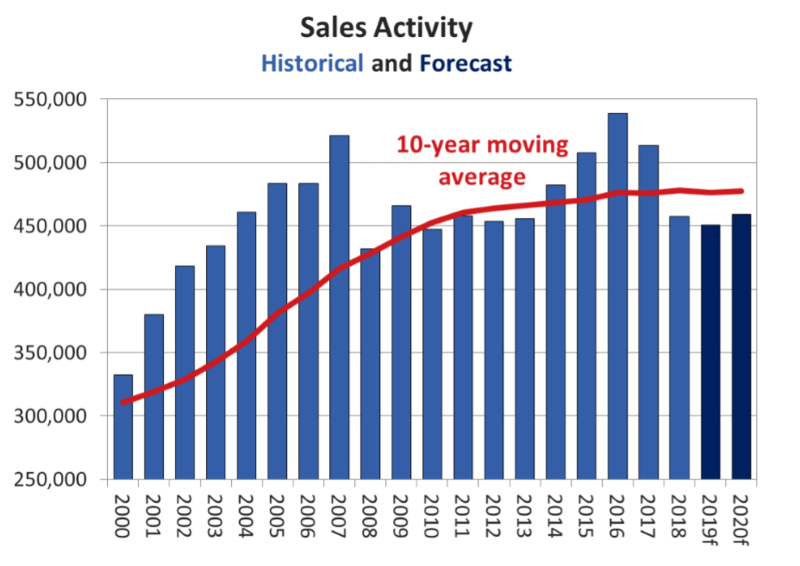 Ottawa, ON, March 15, 2019 – The Canadian Real Estate Association (CREA) has updated its forecast for home sales activity via the Multiple Listing Service® (MLS®) Systems of Canadian real estate Boards and Associations in 2019 and extended its outlook to include 2020. National home sales are projected to ease by 1.6% to 450,400 units in 2019, marking the weakest annual sales since 2010 and the lowest per capita sales activity in nearly two decades. With further interest rate hikes this year having become less likely, the monthly trend for sales is generally expected to improve slowly from a starting point that has been lowered by tightened mortgage lending and provincial housing policies in recent years. British Columbia is again expected to account for much of the projected decrease in national sales this year, along with a further expected decline in Alberta, but that should be offset by continuing strength in Quebec activity and a small gain in Ontario. 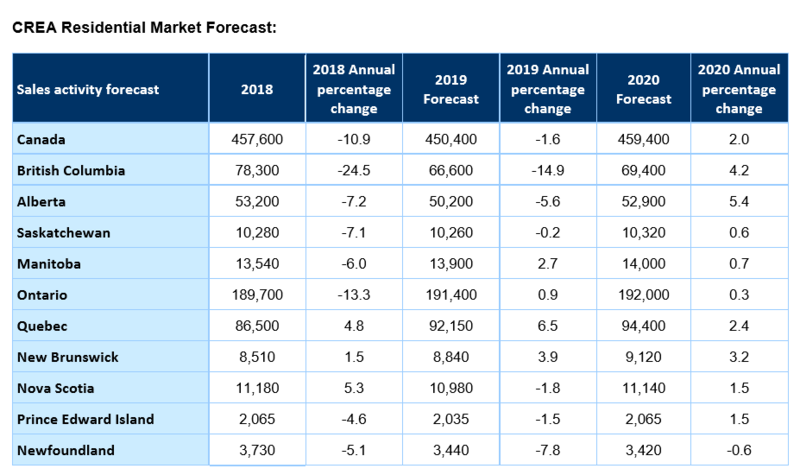 The national average price is projected to stabilize (-0.2%) at around $487,000 in 2019 following a 4.1% drop recorded in 2018, which was the largest in almost 25 years. The average home price is forecast to retreat in British Columbia, Alberta, Saskatchewan and Newfoundland and Labrador. In the latter three provinces, the supply of homes available for sale is historically elevated relative to sales activity. Meanwhile, home prices in Eastern Ontario, Quebec, New Brunswick, Nova Scotia and Prince Edward Island are expected to continue rising in line with their firmer market balances. Prices are also expected to rise in Ontario’s Greater Golden Horseshoe where homes remain in short supply. National sales are forecast to move slightly higher in 2020 (459,400 units; +2%), as the resumption of interest rate increases and the mortgage stress-test offset continuing population, job and income growth. Sales are forecast to rise in all provinces but Newfoundland and Labrador, with a partial recovery in activity in British Columbia and Alberta combined with further gains in Quebec contributing most to the gain in national activity. Despite a small expected rebound in British Columbia and Alberta, sales in these provinces would nonetheless remain 10-20% below their 10 year averages, as would sales in Saskatchewan and Newfoundland and Labrador. The national average price is forecast to edge higher by 0.8% to $490,800 in 2020, reflecting further average price gains in Ontario, improving sales activity in British Columbia and Alberta (despite further price declines), and the combination of both higher sales and average prices in Quebec. 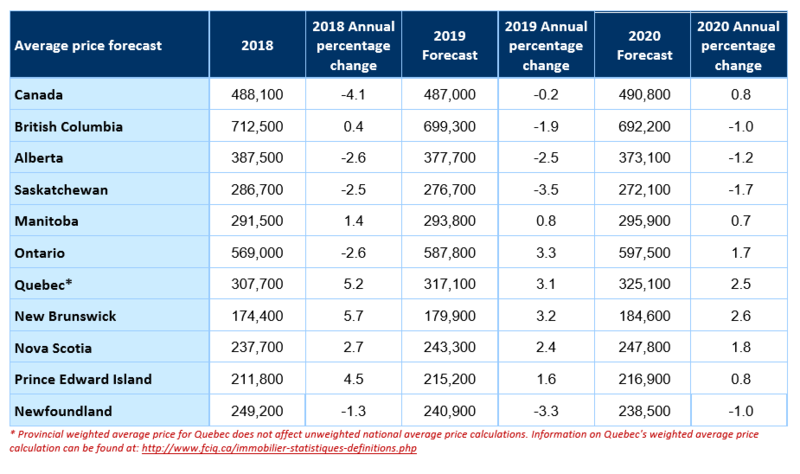 Average price trends across Canada in 2020 are generally expected to be more moderate versions of those in 2019, with small declines in British Columbia, Alberta, Saskatchewan and Newfoundland and Labrador, and modest gains in all provinces from Manitoba through to the Maritimes.